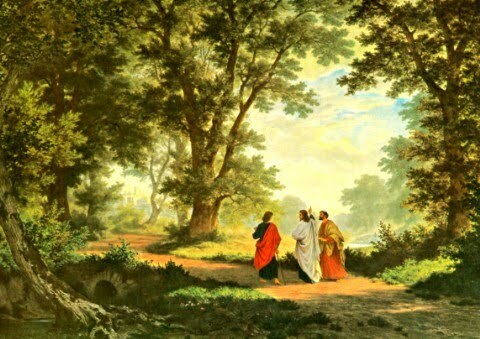 The loveliest thing about returning to church for Evensong last night was to hear Luke 24 read as the Second Lesson - the account of the Risen Jesus appearing to the disciples on the Road to Emmaus, whose hearts burned within them as he explained the Scriptures, and who eventually knew him in the breaking of the bread. For Passiontide meditation this year I read each day from "Life Through the Cross", by Marcus Loane, published in 1966, the year he became [Anglican] Archbishop of Sydney. (He died only last year, aged 97.) Sir Marcus did not set out to write an "original" commentary, or to break new ground in Biblical scholarship; his sole purpose was to beckon his readers' gaze to the Man of Sorrows who died for our salvation and rose to share his victory with us. As always, Sir Marcus did it so movingly. A "literary hack" like me is reduced to wonder just by his turn of phrase. He was an artist who painted with the English language, a real wordsmith, precise and poetic at the same time. I loved hearing him preach. 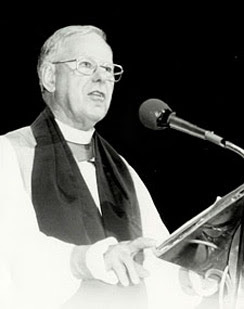 Indeed, I remember - as if it were yesterday - the sermon he gave at my Confirmation in 1964. An old fashioned evangelical, his dislike of Anglo-Catholicism failed to diminish his real fellowship with and respect for those individual Anglo-Catholics he felt loved the Lord and preached the Gospel. "He expounded unto them in all the scriptures the things concerning himself." There were many fingers of a prophetic character which all pointed forward to the Christ that should come. He was the seed destined to crush the head of the serpent (Genesis 3:15; 1 John 3:8); He was the lamb God would provide as substitute and sacrifice (Genesis 22:8; John 1:29). He was the true Paschal victim whose blood would be shed for many (Exodus 12:13; Matthew 26:28); He was the great High Priest who would enter into the holy of holies once and for all (Leviticus 16:2; Hebrews 9:12). He was like the smitten rock from which there sprang a stream of living water (Numbers 20:11; John 7:38); He was like the brazen serpent that was lifted up for life and healing (Numbers 21:9; John 3:14). He was that star out of Jacob which shone as the herald of a new day (Numbers 24:17; Revelation 22:16); He was that great prophet whom God promised to raise up like unto Moses (Deuteronomy 18:15; Acts 3:22). The Psalms had told how He would come to do the will of God (Psalm 40:7, 8; Hebrews 10: 7), and how the nails would pierce His hands and feet (Psalm 22:16; Matthew 27:35). The Prophecy of Isaiah had made it clear that He would bear our grief s and carry our sorrows (Isaiah 53:4; Matthew 8:17), and that He would be led like a lamb to the place of slaughter (Isaiah 53:7; Acts 8:32). It was through Him that a fountain would be opened for sin and uncleanness (Zechariah 13:1; 1 John 1:7); it was in Him that the sun of righteousness would arise with healing in His wings (Malachi 4:2; Luke 1:78). He was prefigured in the symbolic character of things like the pillar of cloud by day and the column of fire by night, the blood of sprinkling and smoke of sacrifice, the seamless veil and mercy seat; He was foreshadowed in the personal history of men such as Joseph and David, Jonah and Jeremiah, Daniel and Mordecai. There were indeed countless signposts to show that Christ was in all the Scriptures and that He was no other than Jesus of Nazareth. This fact was so significant that it formed part of the apostolic witness from the outset: "Let all the house of Israel know that God hath made that same Jesus, whom ye have crucified both Lord and Christ" (Acts 2:36). The Son of Man had been impregnable in His appeal to the testimony of the Scriptures; they were the rock on which He had taken His stand against all the storms of controversy. "Ye search the Scriptures," He said for in them ye think ye have eternal life: and they are they which testify of me: And ye will not come to me, that ye might have life" (John 5:39, 40). They sat in Moses' seat, yet they did not believe Him of Whom Moses wrote: "Had ye believed Moses, ye would have believed me," He said; "for he wrote of me" (john 5:46). Men who knew the letter of the Law had no real insight into its truth, and could make no reply to His devastating criticism. Had they never read what Moses wrote? (Mark 12:26). Had they never read what David did? (Mark 2:25). Nothing is so final as the statement which He ascribed in parable to Abraham: "They have Moses and the prophets; let them hear them" (Luke 16:29). But there was aplausible argument which was meant to turn the edge of these words: men would be more likely to repent if one were to visit them from the dead. Then He declared in words of absolute finality: "If they hear not Moses and the prophets, neither will they be persuaded though one rose from the dead" (Luke 16:31). Thus a solemn appeal to the Scriptures bears out the claims of truth with the most far-reaching authority: "To him give all the prophets witness, that through his name whosoever believeth in him shall receive remission of sins" (Acts 10:43).